Sometimes, with all the imported fruits and vegetables we get nowadays, it’s hard to remember that produce has seasons. 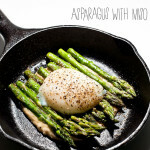 But whenever I see asparagus popping up at the store I know that spring is on it’s way. I love the bright green flavour of asparagus. It tastes just like spring. Asparagus is fantastic simply cooked with a sprinkle of salt and pepper, but if you want to get really fancy, there are so many ways to dress it up. 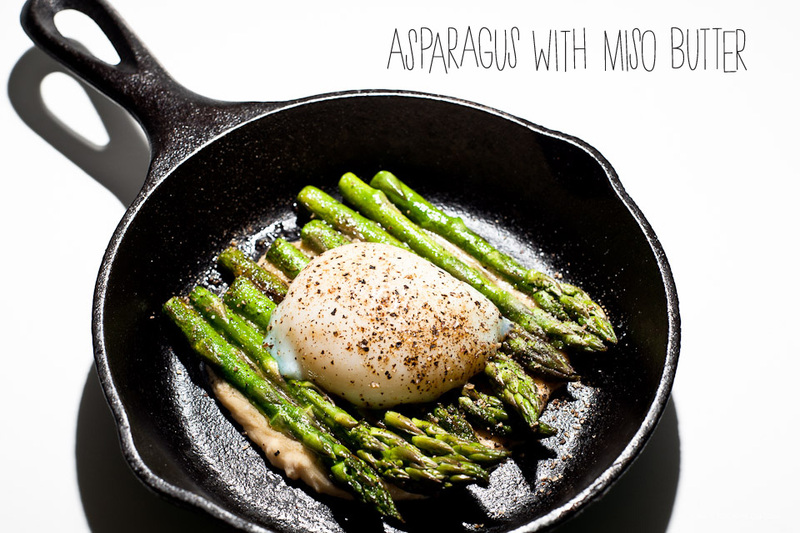 One of my favourite cookbooks, Momofuku, has the best asparagus recipe: pan roasted asparagus with miso butter. The dish really brings out the flavours of the ingredients. 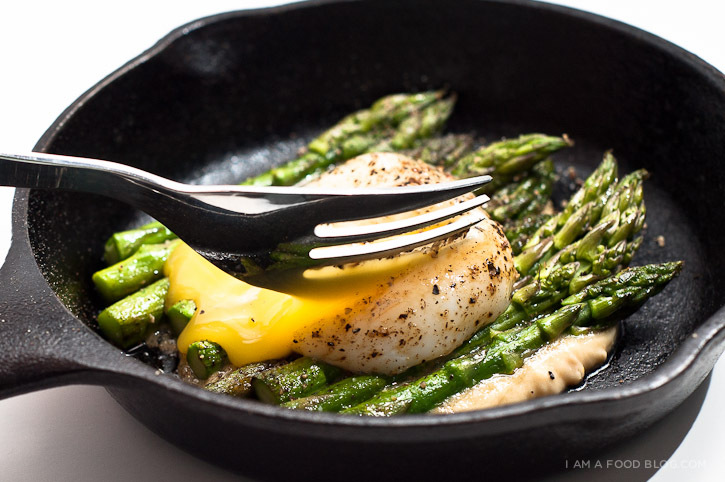 The asparagus is crisp and fresh against the richness of the poached egg and miso butter. Miso butter is absolutely delicious. It has a super umami flavour that kind of reminds me of cheese. This dish tastes just like spring: the creaminess of the poached egg; the crisp, succulent asparagus, and the hint of nuttiness from the miso butter reminds me of sunnier days to come. I am roasted, I am miso-buttered I am asparagus with miso butter! 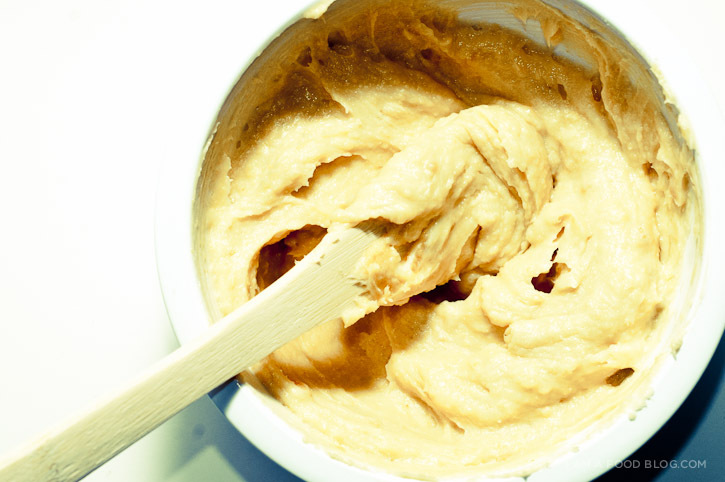 Mix together the miso and butter until smooth and uniform. Set aside. In a skillet, heat up 2 tablespoons of butter over medium high heat. When the butter is barely melted, put the asparagus in the pan. When they start to turn bright green, about 2-3 minutes, turn the heat down to medium low and turn so the second side can cook. When the asparagus is tender, about another 2-3 minutes, remove from the pan and place on paper towels to drain. Place a dollop of miso butter on a plate. Top with the asparagus and a poached egg. Season with salt and pepper. Enjoy immediately! Ah finally I know what to do with that miso that’s in my fridge since forever. It looks deliscous, I hope it will be as nice tasting this as seeing it on your homepage. 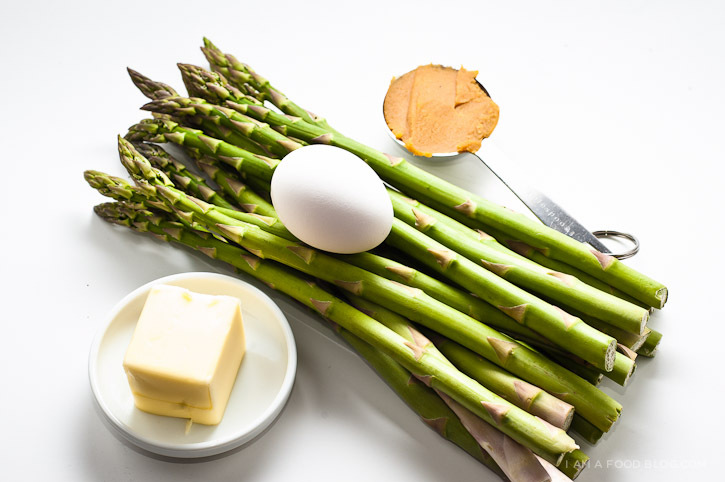 I Love asparagus with hollandaise, this sounds like another perfect combination!! Divine! My whole family love asparagus and miso! One of my all-time favorite recipes! When asparagus is out of season (like right now), I sometimes substitute sautéed kale or roasted broccoli; it’s not quite the same, but still quite tasty.